It’s been eight long months since the last week Badger football game week. Thankfully the wait is over. Through the season I’ll be previewing/reviewing Badger games. To start things off, a full season preview is in order (and also because UMass is a 45 point underdog and doesn't warrant a full blown preview). The three time defending Big Ten Champions have plenty of talent to contend, but with a new coaching staff and a few question marks on both sides of the ball there is a lot left to learn about the 2013 Badger squad. successful at it. Led by James White and Melvin Gordon the Badgers have the best running back tandem in the conference and one of the top in the country, a quick review of the Big Ten Title game of last year will squash doubts of that. The offensive line will be slightly revamped needing to replace stalwarts Travis Frederick and Ricky Wagner, but at Wisconsin you don’t rebuild the offensive line, you reload. Another strength of this squad is at TE. Offensive coordinator Andy Ludwig declared there are 4 starting caliber tight ends on the roster in Jacob Pedersen, Brian Wozniak, Brock DeCicco and Sam Arneson. I expect all will be used in various formations and game situations. With all that talent, the tight ends will be counted on heavily in the passing game to take some pressure off of wide receiver Jared Abbrederis. No one should expect the offense to suddenly transform into the aerial assault of the Greatest Show on Turf. But an offense like the one in 2010 led by ultra-efficient Scott Tolzien when the Badgers averaged 200 yards passing and rushing per game is very possible. And now for that which remains to be seen. The biggest unknown entering fall camp was who would emerge as the starting QB. Head coach Gary Andersen has been adamant the official starter will be known on the first offensive snap against UMass. Joel Stave and Curt Phillips have separated from Tanner McEvoy for now and were listed as co-starters on the depth chart released Monday. Whoever takes the first snap this Saturday, I expect both will see action and the first two games will effectively be used an extension of the fall camp competition. Wide receiver is another position where someone has to develop opposite Abbrederis. The receiving corps is mostly intact from last year with the addition of freshman Rob Wheelright and redshirt freshman Alex Ericson. Both Wheelright and Ericson have worked into the rotation along with Abbrederis, Jordan Fredrick and Kenzel Doe. As noted previously, the depth at tight end might limit the opportunities in multiple receiver formations unless someone provides a more consistent option. Also keep an eye on Tanner McEvoy. Surpassed in the QB battle, McEvoy athletic ability is intriguing enough to warrant considering as a receiver in the red zone or other situational packages. *Obligatory mention that although no offensive lineman were noted here, they are all stars and their efforts are not forgotten. New defensive coordinator Dave Aranda loves to pressure opposing teams. In previous stops at Utah State and Hawaii he has lead defenses ranked near the top of NCAA in sacks and sack percentage. 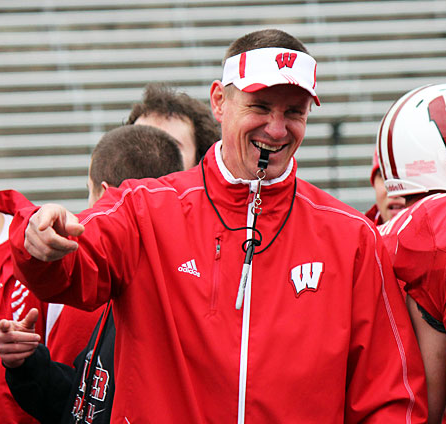 The switch in philosophy from 4-3 to 3-4 fits the Badgers personnel nicely. The defensive line anchored by Beau Allen will need to eat up space and blockers for the stable of outside pass rushers. Starting with Chris Borland, the Badgers have several linebackers capable of rushing the passer. But more importantly, Aranda’s defensive philosophy will allow for more aggressive, attacking defense. Expect a lot more plays like this one from Chris Borland last year against Nebraska. (actually you probably won’t see many like that – it was ridiculous). The front seven is deep, experienced and will be the strength of defense. In order for the blitz to be effective though, the secondary will need to adjust to more press man coverage and overall physical play. This could be a tall task for a group that will replace three of four starters from last season. The inexperience in the secondary could be partially negated simply through lack of opponent passing proficiency. 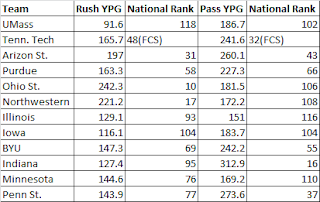 Below are the 2013 Badger opponents and their offensive ranks in rushing and passing yards last year. 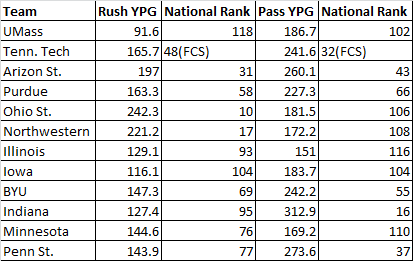 Only Indiana ranked in the top 35 in the country in passing yards per game. The Badgers do not have a NFL passing caliber QB on the docket this year (sorry OSU fans Braxton Miller is not feared due to his arm). As inexperienced as the secondary may be entering the season, they may not be tested very often, especially if the blitz happy Aranda can terrorize quarterbacks as expected. throughout practice to introducing the ‘big brother’ program matching upperclassmen with first year players, seemingly every decision has been a hit with players and fans. For me one of the biggest things was involving Tanner McEvoy at wide receiver after he fell behind in the quarterback race. Finding a spot on the field for the most talented players is something most coaches preach in theory but rarely practice. Andersen quickly won over players through his genuine demeanor, often calling players out of the blue to check in on their lives. At practice Andersen sometimes participates in drills(he was a center when he played) and organizes impromptu dance offs. "That stuff is fun for the kids," Andersen said. "I think it brings energy and excitement. You get out there for recruiting, if I am a player, I want to have fun playing football." Obviously his ultimate test will be results on the field during fall Saturdays, but signs point to continued football success for the Badgers under Andersen. Gary Andersen and staff arrive in Madison amid unusual circumstances for the program. On one hand, the Badgers have been to three straight Rose Bowls, return 15 starters but are considered a distance second to Ohio State in the Leaders Division Additionally, the 2013 schedule sets up nicely without a super challenging non-conference slate while avoiding Michigan, Michigan St. and Nebraska within the conference. Expectations are high in Madison and anything less than a 9-3 record will be and should be considered a disappointment. The season effectively boils down to the September 28 showdown against Ohio State in Columbus. If the Badgers can win that game they will be in the driver’s seat for the division and will end up in another BCS bowl game. However I see the Badgers bowing out to the Buckeyes and dropping one other unexpected game on the road, most likely at Iowa where they have traditionally struggled. Badgers also cannot overlook Arizona State. Opening with UMass and Tennessee Tech will not be much of a challenge, playing in Tempe at night will be the first test of the season. The verdict for this team is 10-2 and another New Year’s Day Bowl game. Follow us on Twitter (@WISportsBlog) for up to date news on the Brewers, Packers, Badgers, Bucks, and Golden Eagles. We feature live, in-game commentary, breaking news, previews and post game discussions. Follow the entire Wisconsin Sports Blog writing team on Twitter: @AndrewVrchota, @jheldred, @JoeP_Norton, @olewr7, @Stevie2Westside, @TABrown23, and @10iskristin.